An Iowa forestry expert says the annual show of fall colors is right on schedule this year. Jeff Goerndt is with the Iowa Department of Natural Resources. “This seems to be a pretty normal year,” Goerndt said. Hard maple trees, which produce brilliant oranges and reds, are only found naturally in northern Iowa. “The oaks are probably the second most brilliant. We have oaks everywhere in Iowa and they’ll create anywhere from a red to an orange color,” Goerndt said. Hickory and elm trees tend to produce yellow colored leaves. The Iowa D.N.R. 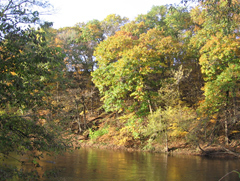 operates a “fall color report” on their website and through a telephone hotline: 515-233-4110.